This may seem like a Euroleague game with not too much riding on it in the final week of the regular season but there will be motivating factors at play for the teams involved in this game. The hosts are unable to claim home-court advantage in the playoffs but they are involved in the next round of the tournament and a win could see them receive a higher berth. This means the home side have everything to play for and they should have more momentum than their opponents who have been eliminated and don’t have much of a reason to be at their best. These teams have met on 15 occasions in the Euroleague so far and it is the Spaniards who hold a narrow lead, with an 8-7 advantage. 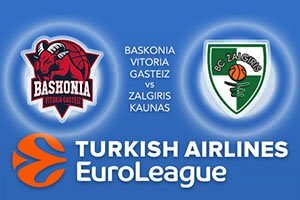 When these teams met earlier on in the season, way back in Round of the Euroleague regular season, it was Kaunas who grabbed the win, triumphing by a score of 78-73. That was a great night for the Zalgiris fans and there was a lot of praise for Leo Westermann who provided 20 points in that win. Baskonia will look towards Shane Larkin in this game and he has delivered for most of the season, offering an average of 12.9 points per game while also chipping in with an average of 5.7 assists per game. Rodrigue Beaubois has offered an average of 11.5 points and there has been a return of 10.7 points per game from Adam Hanga. The Kaunas side have been boosted by Paulius Jankunas, who has provided an average of 13.1 points per game and 6.2 rebounds per game. There has also been good work from Brock Motum who has chipped in with an average of 10.7 points per game while Lukas Lekavicius has notched an average of 8.7 points per game. It does look as though the hosts should have enough about them to take this game and you can back Baskonia Vitoria Gasteiz at -9.5 at odds of 1.90. If you’re looking for the Over/under market, go OVER 160.5 at odds of 1.90. Bet Now!